[320left]Winter weather is likely one factor contributing to the higher prices. While colder temperatures do influence motorists to drive less, it can also influence retailers to increase prices ahead of winter storms, especially at times when motorists are stocking up or panic buying. However, the region’s high stock levels are helping to keep most price jumps moderate. 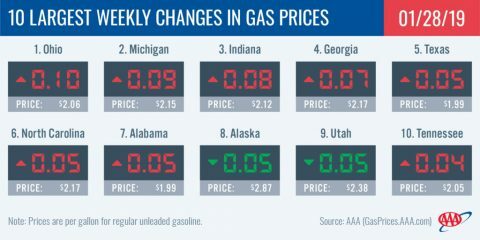 For the states in this region seeing more expensive gas prices, this week’s increases are between one to seven cents more with Georgia (+7 cents), Texas (+5 cents) and Alabama (+5 cents), seeing the largest jumps, as well as landing on the top 10 list among states with the biggest changes this past week. After a large jump the week prior, Florida’s gas price average has decreased a penny to $2.22, while New Mexico ($2.07) also saw a drop and Oklahoma’s average held steady at $1.93. The region’s hefty 90 million bbl stock level, which held relatively flat on the week according to EIA data, is helping to keep any price pump increases moderate. Pump prices in the West Coast region are the highest in the nation, with all of the region’s states landing on the nation’s top 10 most expensive list. [320right]California ($3.25) is the most expensive market followed by Hawaii ($3.24), Washington ($2.92), Alaska ($2.87), Nevada ($2.87), Oregon ($2.80) and Arizona ($2.51). While expensive, prices are falling with all state averages moving lower on the week. Alaska (-5 cents) saw the largest drop.